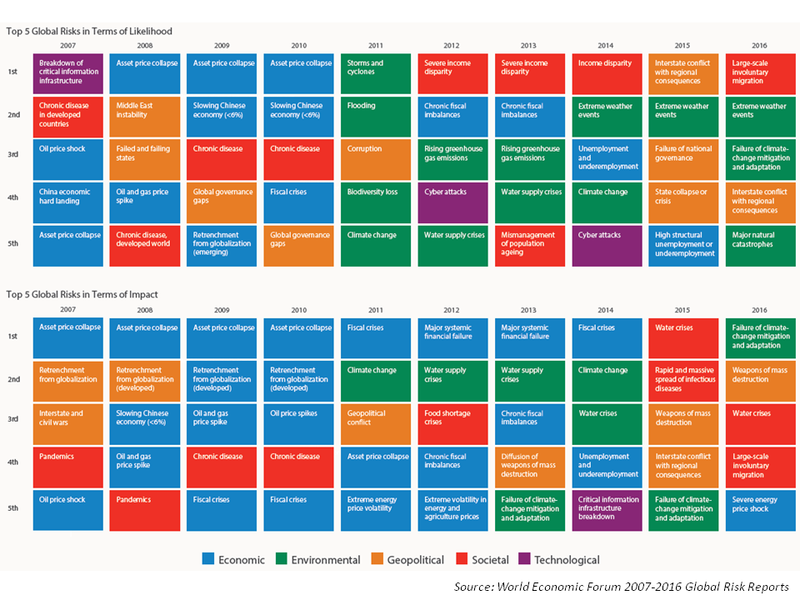 The latest World Economic Forum report on global risks reflects the common concerns of its almost 750 global contributors across multiple disciplines. Such reports are often poor predictors of issues (e.g. the emergence of the migrant issue in Europe) but do reflect current thinking as the graphic below on the changing risks by likelihood and impact illustrates. The government faces a dilemma. If it tightens credit conditions, it could reduce investment more quickly than consumption can increase to compensate, and cause massive defaults among struggling and heavily leveraged companies. 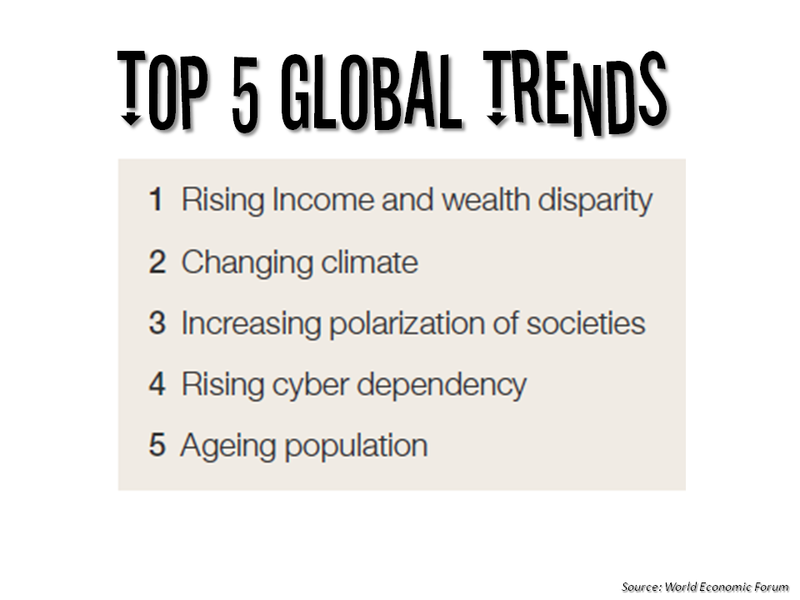 This could mean a much more severe economic slowdown, potentially causing a surge in unemployment and social unrest. However, if the government lets more credit flow to avoid these destabilizing defaults, it risks further increasing the indebtedness of underperforming industries and creating bigger problems down the line. 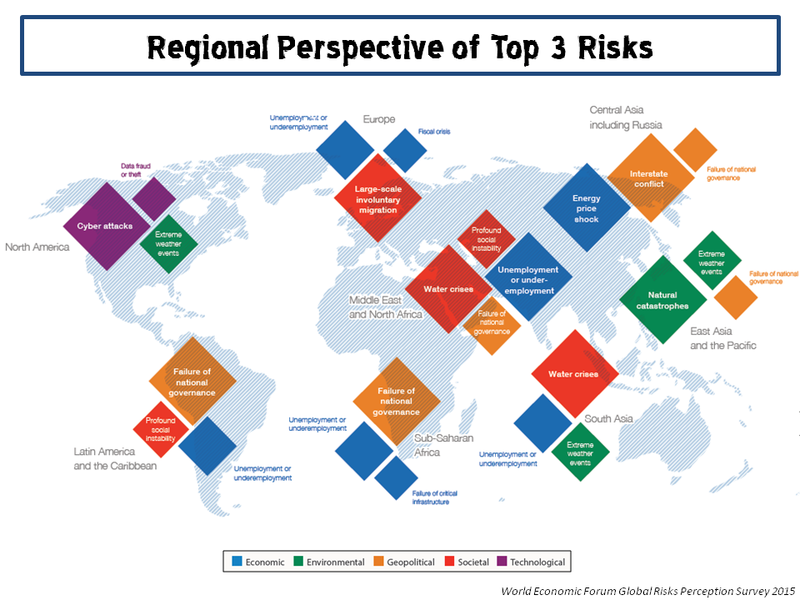 Unsurprisingly, different regions in the world have different concerns and it’s interesting to compare and contrast each. 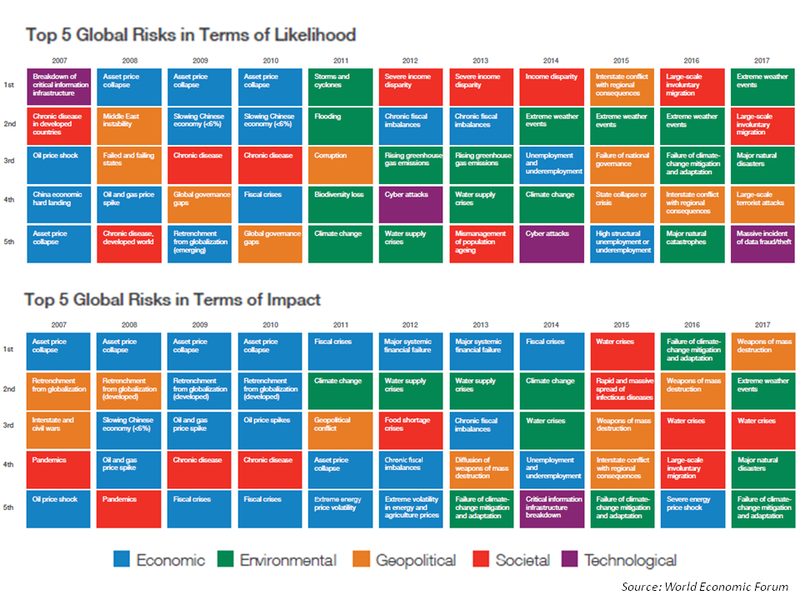 Climate change, extreme weather and water issues are ever present risks. 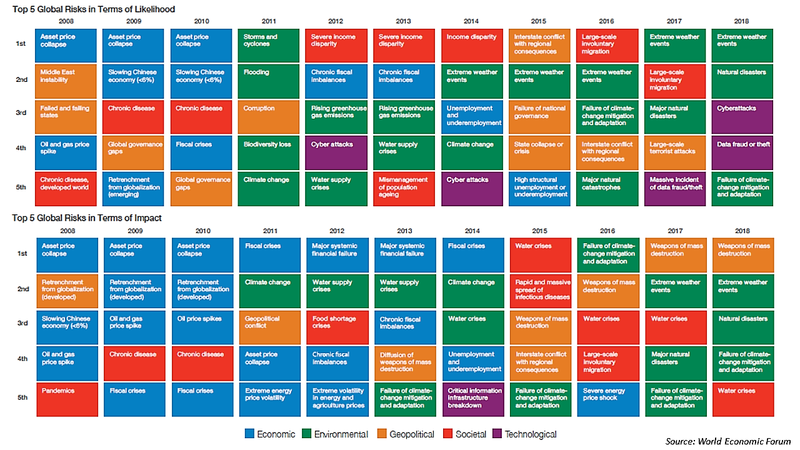 At least it’s reassuring to see that the 5th IPCC assessment report (as per this post) does seem to have moved the debate on from whether we humans are impacted climate to the speed of implementing the mitigation and adaption actions required. 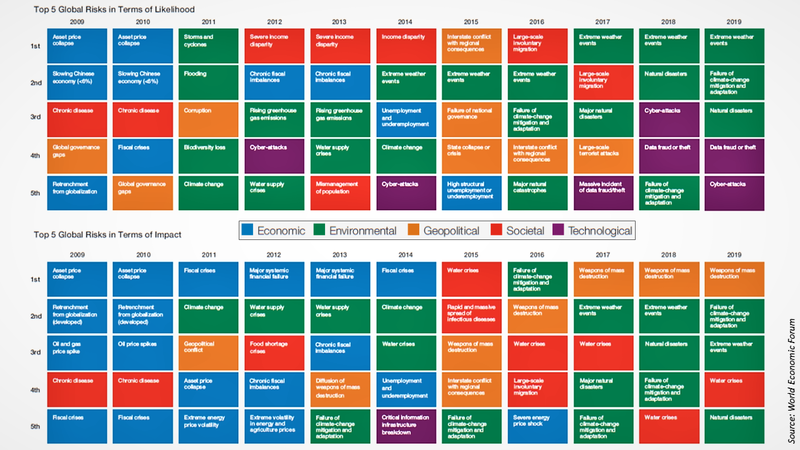 As the WEF report states, the Paris Agreement reached last December is a positive step although “to date, nearly 190 governments have submitted their climate action plans, covering over 95% of total global emissions” and “these efforts alone will not suffice as even the most optimistic estimates suggest that these pledges taken together would contain warming only to 2.7°C above pre-industrial levels.” Over 2.0°C is commonly believed to be the point where things could get extremely unpredictable. The Paris Agreement is however better than previous efforts and therefore represent progress.